We love to flavor water with fresh fruit, and to add fruit to ice cubes. Here’s a twist on conventional ice cubes: Use frozen fruit instead of ice cubes. 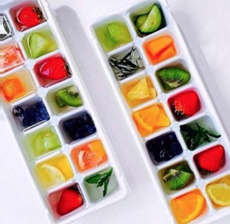 We have long made “party ice cubes” with a strawberry or other fruit (plus herbs, or savory ice cubes like cherry tomatoes and basil) embedded in an ice cube, but with frozen fruit only, there’s no surrounding ice to dilute the drink. Plain frozen fruit alone works better for drinks that are already chilled. Fruits embedded in ice cubes will keep frozen longer, and are better for room temperature drinks. However, watermelon, with its higher water content, can be cut into ice cube shape. The flavor doesn’t work with every beverage, but when it does, it’s terrific! Wash and pat dry fresh strawberries or other fruit. If the leaves on strawberries are perky-looking, you can leave them on. Place the fruit in the freezer in a pan, spaced so they don’t freeze together. When the fruit is frozen, you can remove it to a storage bag. The easy way: Purchase bags of frozen fruit and use two or more varieties in each glass—strawberries and sliced peaches, for example. Match the fruits to the flavors and colors of the drinks: cherry ice cubes, citrus (we love blood orange or grapefruit), cucumbers, grapes (use mixed colors), melon (try melon balls), other berries and sliced stone fruits. Don’t stockpile the frozen fruit or fruit ice cubes: Make only what you’ll use within a week. 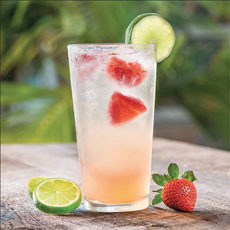 Top: Freeze fruit to substitute for ice cubes (photo courtesy California Pizza Kitchen). Bottom: The more conventional way: Add fruit or herbs to the water before freezing the ice (photo courtesy Zespri| Facebook).